What: Discount on jewelry. Rhinestone bangles are $40 (were $125) and the enamel snake bracelet is $75 (was $215). Cash Only. Where: 147 W. 29th Street - 5th Floor (b/n 6th & 7th Ave). Where: 35 W 36th St., 10th floor (b/n 5th & 6th Ave). Where: 1375 Broadway - 5th floor (near 37th St.). What: Up to 80% off cashmere knitwear for men and women. Cashmere blended sweaters are $40-$179 (were $195-$895). When: December 2-5, 2010. Thurs-Sat (10am-7pm), Sun (11am-6pm). What: Discounts on hand painted, cashmere & silk wool blended scarves. Scarves will be $35-$60 (were $160). Where: 49 W 38th St. - 9th floor (b/n 5th & 6th Ave). Where: 109 W 38th St., suite 301 (b/n 6th & Broadway). What: First ever Simon Spurr sample sale with the majority of pieces below wholesale. Melton wool duffle coats are $705 (was $1,605), leather police jackets with shearling collars are $508 (was $1,395) and reverse-stich cashmere roll-neck sweaters are $370 (was $895). 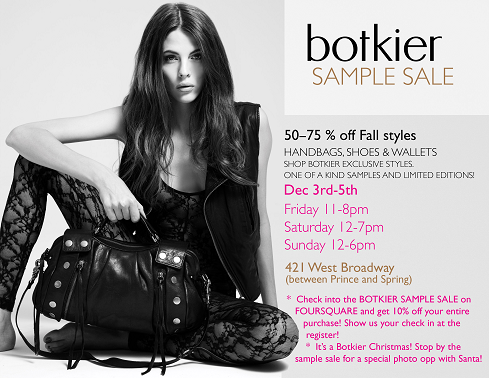 I am so excited I'll be in New York City this weekend and will get to check these sales out! HAUTE HIPPIE SAMPLE SALE AT 225 5TH AVE, (27th/26th st). Saturday December 4-10th. 260 sample sale facebook page has all the deets. Have a great time in the city and let us know how you make out at the sales! hey anyone know how the tucker pricing is at their sales??? Will do, thanks for posting these up! This is very innovative peace of work about fashion and style it so beautiful.